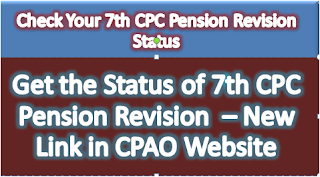 Sub: Providing a link of CPAO website in the websites of Ministries/Departments and their attached/subordinate offices to get the status of 7th CPC pension revision by the central civil pensioners. As you are aware that 7th CPC pension revision for Pre-2016 pensioners/family pensioners is going on in compliance to the DP&PW OM dated 12th May, 2017. As on date, more than 5 Lakhs pension revision cases of central civil pensioners/family pensioners have been received in Central Pension Accounting Office (CPAO). CPAO is receiving many queries from the pensioners/family pensioners regarding status of their pension revision. CPAO is providing the status of pension revision to the pensioners. The pension revision status can also be checked by the pensioners/family pensioners through CPAO website www.cpao.nic.in by entering their 12 digit PPO numbers. For the wider publicity of this facility among Central Civil Pensioners/family pensioners, it is felt necessary that a link of this facility available on CPAO website may be provided in the official websites of your Ministry/Department and its attached/subordinate offices for the benefits of pensioners. 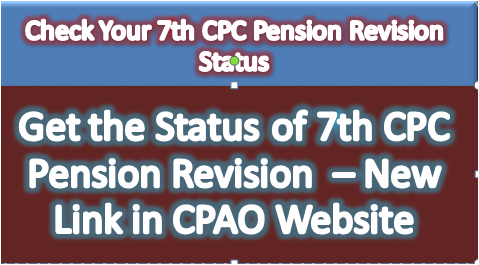 It is therefore requested that a link of following URL of CPAO website: http://cpao.nic.in/Pensioner/ppo_status.php may be created in the websites of your Ministry/Department by the NIC Wing under the caption-“Check Your 7th CPC Pension Revision Status”. For any query, Sh. Davinder Kumar, Sr. Technical Director, NIC, CPAO may be contacted on Telephone NO.011-26715338 and email-kumardavinder©nic.in. Providing a link of CPAO website in the websites of Ministries/Departments and their attached/subordinate offices to get the status of 7th CPC pension revision by the central civil pensioners.